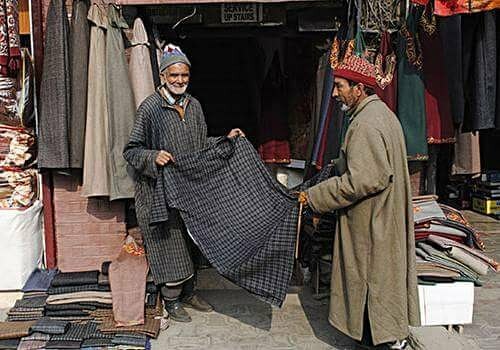 The Kashmiri word “Pheran” is contraction of the Persian word “pairahan” which literally means garment & which clearly shows its origin to the time of Mughal rulers who had Persian descent; notwithstanding, some Kashmiri Pandits in recent times have tried to connect its origin to the Greek word “Apron” & even the Tajik word “Peraband. But both these words are farfetched & improbable since these words do not find mention in the acclaimed books of historians, travelers or geographers of Kashmir. There are several stories associated with Pheran in Kashmir. One narrative is that the Emperor Akbar was enraged at the bravery & prolonged resistance offered by the Chaks to his General Qasim Khan, who decided to effeminate, unman & degrade the people of this country, and so, he ordered the people, on the pain of death, to wear Pheran which has hindered them in battles & all manly exercises. The object, according to this theory, was to make Kashmiris lethargic & indolent by keeping their hands always inside it on a warm Kangari, fire-earthen-pot, which killed their martial habiliments & warlike spirit against the Mughal rulers. Dr. GMD Sufi (D Lit) rejects this narrative by saying that if this story were true, then the Kashmiris would not have required Kangari at all. Sir Marc Aurel Stein regards it as silly story. Pir Hassan Shah says that Pheran was introduced during the time of King Zain ul Abidin. Pheran is a long loose garment worn in Kashmir by both men & women. It has also been equaled and compared with /cloak/coat/apparel/gown/wrapper/tunic by different travelers, historians, explorers & anthropologists of Kashmir. Anyway, it is a heavy & full garment with buttons or zip around the neck-opening, without slits, falling slightly above the feet among non-Muslims & below the knees among the Muslims. Weight is given to the bottom of this garment by a deep hem. It is made of cotton or wool. When it is made of cotton, it is called Potsh & when it is made of wool, it is called Loch. And, Potsh which was , till few decades ago, used during summer is not now so common among the present Kashmiris owing to change in their dressing habits, just like that of other communities world-over; even though some old traditional Kashmiris still wear it in some villages & parts of cities & towns. Today, Potsh is, if at all, used as detachable underclothing of Loch. It is worn beneath Pheran, generally, to protect Pheran from burns due to the use of kangari inside & also to provide extra warmth due to double layered protection from the bitter cold of winter days. Loch which is now only & real known Pheran in Kashmirian-use & exclusively used during winter is manufactured of wool or tweed, or Puttu. Under the tunic of Pheran, the wearer uses Kangari, which is an earthen pot with a small quantity of live charcoal, to keep the wearer warm against the cold. Pheran is required against the inclemency of the weather in Kashmir, to fight against the chilly weathers of winter; though there are now many latest electronic & other items too available in Kashmir to warm bodies & rooms. In the past, the woolen-cloth used for Pheran was either manufactured in Kashmir on home looms or imported from Punjab. Now, the wool, tweed, Puttu, of which the Pheran is invariably made, is all imported from outside Kashmir. In the past, a long piece of cotton stuff called lungi was worn around the waist over Pheran by the Panditanis/Kashmiri Hindu women who would never go out of home without this girdle. But now this old tradition of fastening belt around the waist over Pheran is not visible among the Panditanis in Kashmir; though many young Kashmiri Muslim boys like having this belt around waist on their Pherans. In olden times, writes Pandit Anand Koul, every Kashmiri male Hindu/Pandit would carry a Qalamdan (pen cases) in the girdle bound over his Pheran round his loin or under his armpit wherever he went. In the past, the colours of the Pherans used to be limited to red & blue only. But today, the progress of textile industry, has added all possible colours to the stuff used for making of Pherans. The women generally like bright colours, while men like light colours. Today’s Kashmiri young boys like black & dark colours, and round collars, buttons at the cuff & girdle at the waist of Pheran, and all these goodies give Pheran look of a gown or overcoat. Pheran is almost the same of both men & women. However, the sleeves of the women’s Pheran are wider than those of the men’. As a natural inborn tendency to look graceful & beautiful, the Kashmiri women, now, tend to give feminine touch to Pheran by getting it embroidered with Zari-work, or multi-colour threads in the shape of exquisite flowers & designs at the bottoms & around neck-opening, naal. The men like simple Pherans without any kind of embroidered designs & styles. The married women get the costly tilla-work done through tilla-dozs/ embroiders on their Pherans. Tilla is a royal taste, golden & silver colour threads, embroidered on Pherans, etc. Tilla-embroidered Pherans form a special part of parental-gifts to their daughters at their weddings. They constitute a unique part of Verdan (parental-gifts) at the time of wedlock of daughters in Kashmir. There is also a well known Kashmiri idiom related to Pheran which is “phirith pheran tshunun” which equals in English to putting a Pheran inside out, meaning the guilty blaming the accuser.